Water festival or Regatta Lepas which was held on April 26 to 28 gave children the opportunity to learn about natural treasures and how to protect them. With the theme ‘Kami Menghargai dan Melestarikan Alam Marin Semporna’, WWF-Malaysia has conducted a series of interactive awareness activities. Together with volunteers from Green Semporna, the national conservation organization engaged the children in fun activities such as “Ninja Sea Turtles” that showcased the lifecycle of sea turtles, a matching game to identify terrestrial and marine creatures according to their environment, and colouring contests and quizzes. Some 100 children and their families participated daily in the Regatta. Apart from the games that appealed to all age groups, an exhibition on examples of alternative livelihood was hosted by the Women Association of Pulau Omadal (WAPO) for communities who are dependent on fisheries. The WWF-Malaysia booth was crowded throughout the three days as the enthusiastic team engaged with the local community who visited the Green Marine Tourism exhibition. WWF-Malaysia’s Sulu Sulawesi Marine Ecoregion Programme Manager, Robecca Jumin said it is important for the local community, particularly children, to understand the role of marine life, specifically coral reef and turtles, in the whole ecosystem and the community need to be prepared to be green tourist guides as the future of this Priority Conservation Area depends on them. Coral reefs play an important role in fisheries and tourism sectors and Semporna has the largest percentage of coral cover within Malaysia. The beauty and diversity of the coral reefs attract thousands of tourists from all over the world, and the number of tourist arrivals has put increasing pressure on the marine resources. In 2012, a total of 2.88 million tourists were reported to travel to Sabah. This showed the value of tourism as a key income resource as well as highlighted the need to focus on sustainable tourism and protection. In the past few years, WWF-Malaysia has been working together with tourist operators, government agencies and also local communities to ensure that the impact of tourism on the marine resources is reduced. In conjunction with that, WWF-Malaysia initiated a strategy called Green Marine Tourism involving these important stakeholders. The Regatta Lepa is held annually to celebrate the heritage and culture of the people of Semporna, especially the Bajau Laut. The festival attracts people from all over Sabah as well as from other countries. 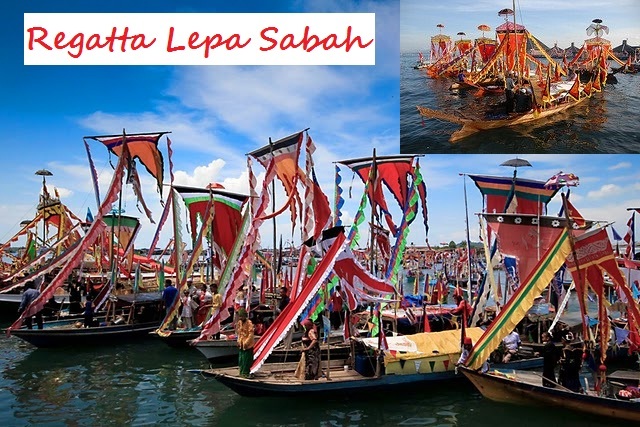 Regatta Lepa is one of the main attraction event in Sabah. It is a good source to inject our economy.